These 300mg CBD Oils are a whole-plant, full-spectrum extract, crafted from hemp cultivated for high CBD content. 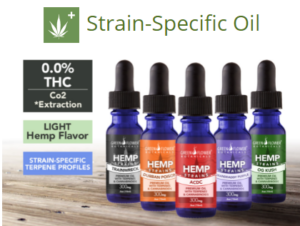 Using a Critical C02 Extraction process, the CBD and beneficial cannabinoids, terpenes, & omega fatty acids, are formulated into a premium-grade, high-concentration, phyto-cannabinoid hemp oil. Following extractionthe oil is infused with additional natural terpenes to recreate the specific terpene profile of the particular medical cannabis strain.